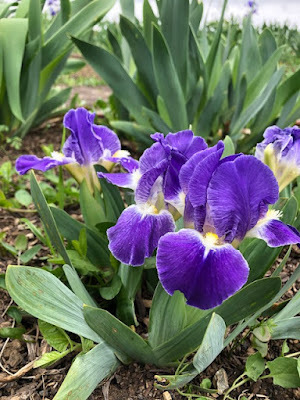 After a long cold winter, nothing invigorates my spirit like going out to the garden and seeing the spring bloom of the irises. The tiny miniature dwarfs are the earliest of the bearded irises to bloom. 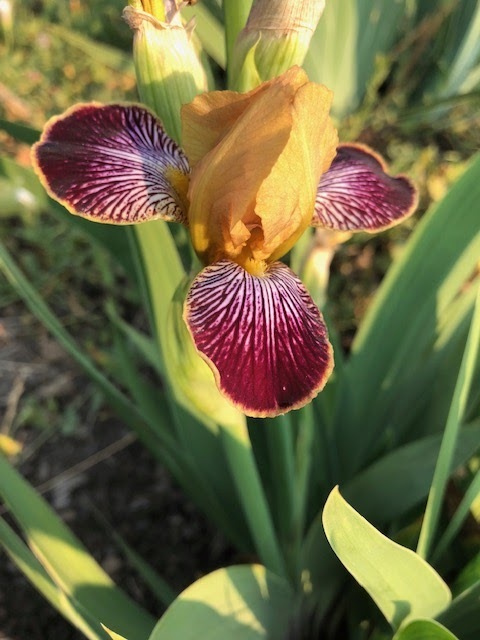 I love the early bulbous irises that bloom even earlier such as danfordiae and reticulata, however, the tiny bearded dwarfs are my favorites. We have a large collection of miniature dwarfs and it is sometimes hard to find a place to put them so they won't get over shadowed by the larger irises. We put one large planting on a bank and when they are blooming in March and April they cover it with a carpet of color. Shorter than the standard dwarf bearded irises (8-16 inches), the miniatures top out at 8" tall. They are tiny and to be enjoyed to the fullest, they should be planted either in a rock garden setting or a raised area. They bloom early too, so you may want to plant them close to your house so you won't miss any of the bloom. "Pixie Flirt' is a vigorous grower and it can grow into a marvelous clump in just a few years. 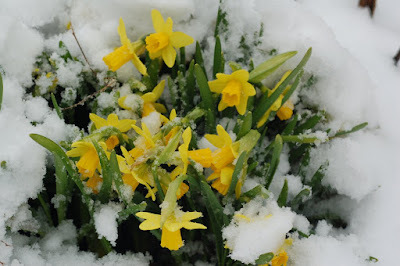 Winter Aconite, Snowdrops, small narcissus such as 'Tete- a- Tete' make good companion plants for the miniature dwarfs. The bulbous iris reticulata is a good companion plant, and they bloom even earlier than the dwarf irises, sometimes even in the snow. The miniature dwarf 'Atroviolacea' is usually the first bearded iris to bloom for us, sometimes even in the March snow. 'Early Sunshine' usually follows second behind the bloom of 'Atroviolacea'. We were excited that our 'Kayla's Song' received the Caparne Welch Medal in 2018. In late April the American Iris Society will hold its annual convention. This year the convention returns to the San Francisco Bay area for the first time in quite a few years. The convention hotel is the San Ramon Marriott, and garden tours will feature five excellent gardens in a variety of microclimates throughout the greater Bay Area. Here is a preview of what you will see at the convention - for even more information, see the convention web site. 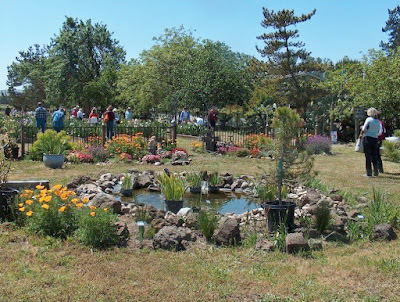 The first day of garden tours will feature two gardens in the greater Sacramento area. 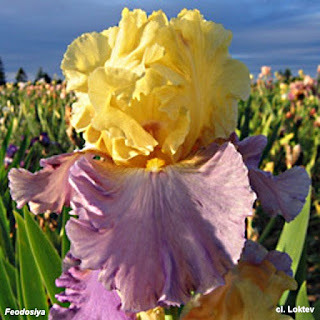 Frannie's Iris Garden is located in Elk Grove, near Sacramento, and is tended by Fran and Russ Shields. 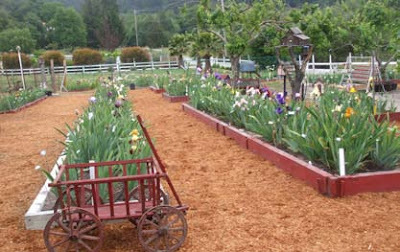 All the iris beds are flat with wide, smooth grassy pathways. If a little rest is needed there is a huge gazebo at the edge of the garden, and cold drinks are close by. The guest beds are laid out for perfect photo shots. Fran has added a few pieces of garden art here and there. Russ and Fran are members of the Sacramento Iris Society. Don't be surprised if, in addition to many beautiful iris, you encounter a llama or friendly papillon! The patchwork quilt garden of Mary Ann and Ed Horton is spread over several acres of irises. This commercial garden is spotless. 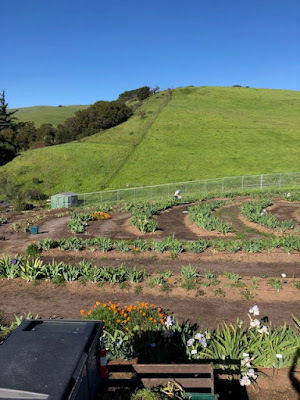 You will get a lot of walking done in this garden - walk quickly as this is a huge garden. There are vintage automobiles on the property that have been restored to original, working condition. Feel free to have your photo taken with them. AIS guest irises are on top of a slight hill. 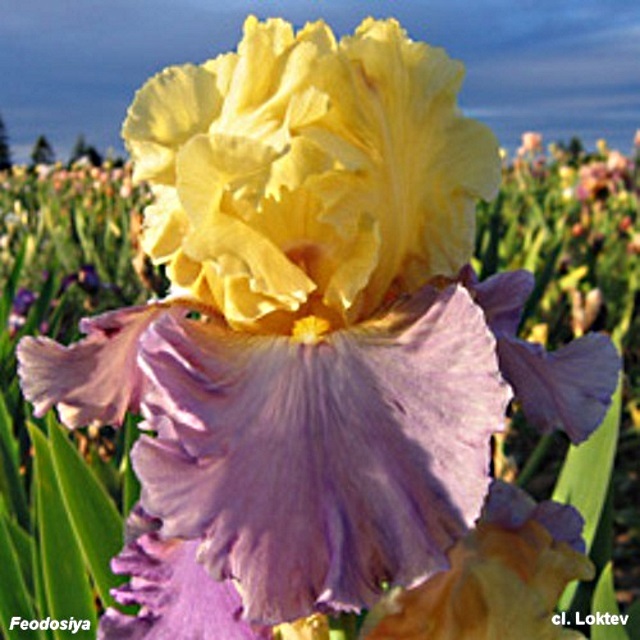 Mary Ann and Ed are members of Sacramento and Sierra Foothills Iris Societies. 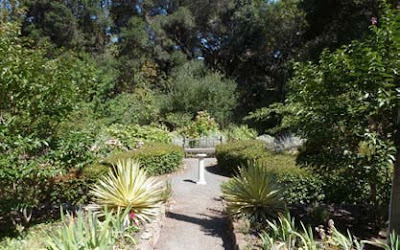 The second day of garden tours takes you to the Sonoma Valley wine country to the C&L Vineyard Garden. This garden is owned by Joe Lawrence and Rudy Ciuca. The grapes will not be ripe but the vines are there, as well as 70 olive trees. 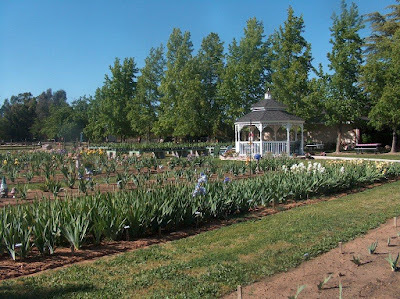 This garden holds several hundred irises in addition to the guest irises. Rudy is a gourmet cook with a gourmet kitchen, so the possibility is good that he will whip up something good to nibble. Joe and Rudy are members of Santa Rosa Iris Society. 'Jade Moon' (O'Brien 1997) C&L Vineyard Garden has all of local hybridizer Lois O'Brien's introductions in their permanent collection. On this day of the tour we will also be visiting Sonoma Plaza, located in downtown Sonoma in the heart of the Somona Valley wine country. There are a wide variety of things to see and do in the Plaza, including historic buildings (among them the northernmost California mission), over 30 wine tasting rooms, plenty of shops, and world-renowned restaurants. More information is available at the Sonoma Plaza Visitor's Guide. The final day of garden tours will visit two gardens. The garden of Jim and Irene Cummins is located in Scotts Valley, not far from Santa Cruz, on a gently sloping hill overlooking a small valley. 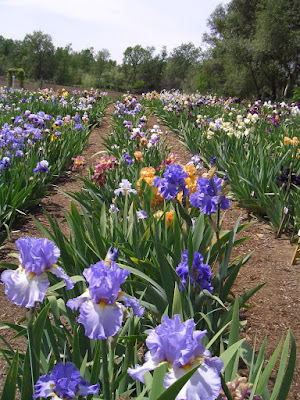 The Cummins' personal garden has hundreds of irises.Guest irises are well marked in a bed away from other irises. A very fun and interesting yard is filled with hundreds of pieces of whimsical garden art. With luck a flock of turkeys may be seen. The Cummins are Monterey Bay Iris Society members. The convention's master planting is the Dry Creek Garden, an historic cottage garden managed by the East Bay Regional Park District, the largest urban park district in the United States. In addition to the large convention planting, you will have many other plants to enjoy over the garden's acreage. The convention planting is overseen by Jeff Bennett, a member of Sydney B. Mitchell and Mt. Diablo Iris Societies. 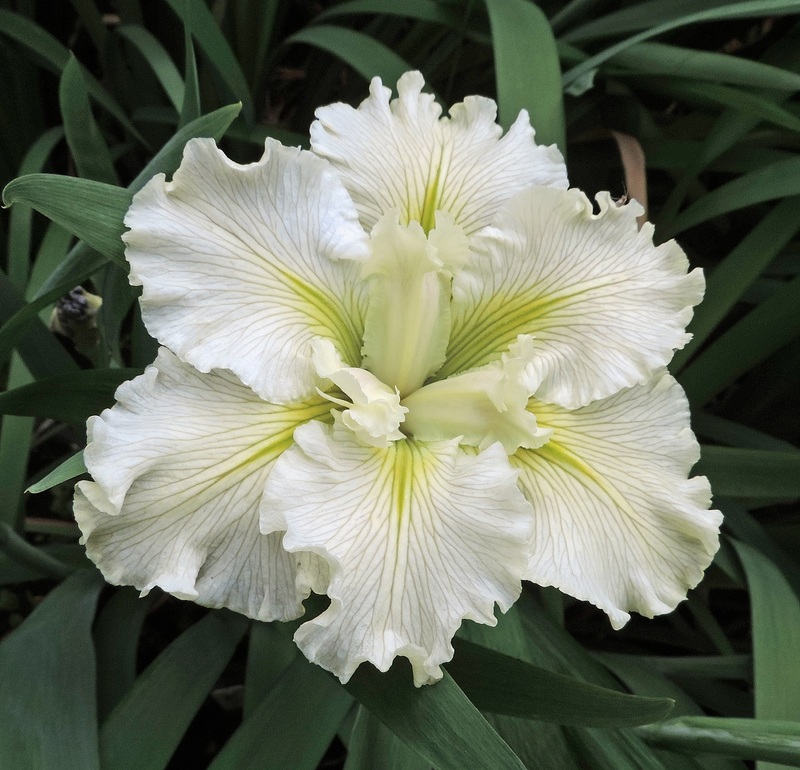 The convention planting will remain a permanent iris planting in perpetuity with new plants added yearly and the historic garden expanded yearly. Any iris planted in this garden hopefully will still be somewhere on the grounds 100 years from now. If you'd like to join us at the convention, registrations are still being taken through April 15. You can register for the full convention, or for single events or tour dates. Price breakdowns and the registration form is available on the registration page. Lots of information and the latest updates are available at the convention web site. We hope to see you at the convention! 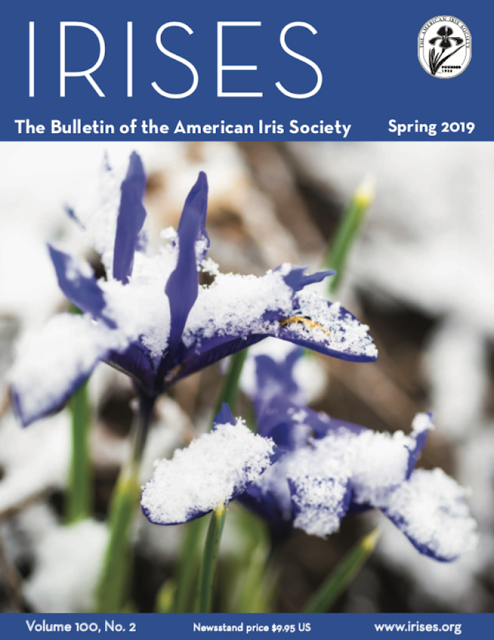 The Spring issue of the AIS Bulletin is already available for online viewing, and accessible via the Emembers section of the AIS website. The print copy has been mailed via the U.S. Post Office. On the cover, a beautiful iris reticulata covered in snow as it awakens from a cold season. A wonderful read about A Few Irises in China, by Panayoti Kelaidis, on pages 16 through 18. Oh, so many lovely images of Iris chrysographes! On pages 20 through 22, a reprint from our blog posts called, A New Iris World, on iris hybridizers in Eastern Europe by Sylvain Ruaud from France. On pages 23 through 25, yet another reprint from our blog posts, this time A View from Russian on Gypsy Lord and Children, by Sergey Stroganov. Ready for photography tips? Find them on the article by Neil Houghton called Job it Out, on pages 26 and 27. And Maryann Schicker talks about Iris Identification Made Easy and Enjoyable, on pages 28 and 29. 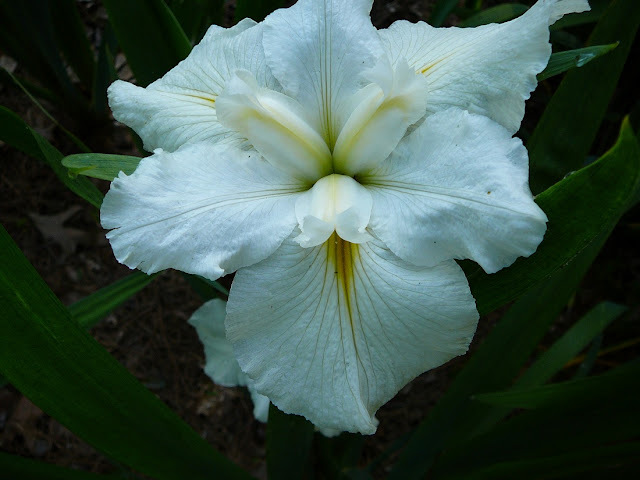 This time we will look at the wide variety of shapes and sizes in white Louisiana irises. White irises must have good substance in order to withstand "washing out" in the hot Louisiana sun. 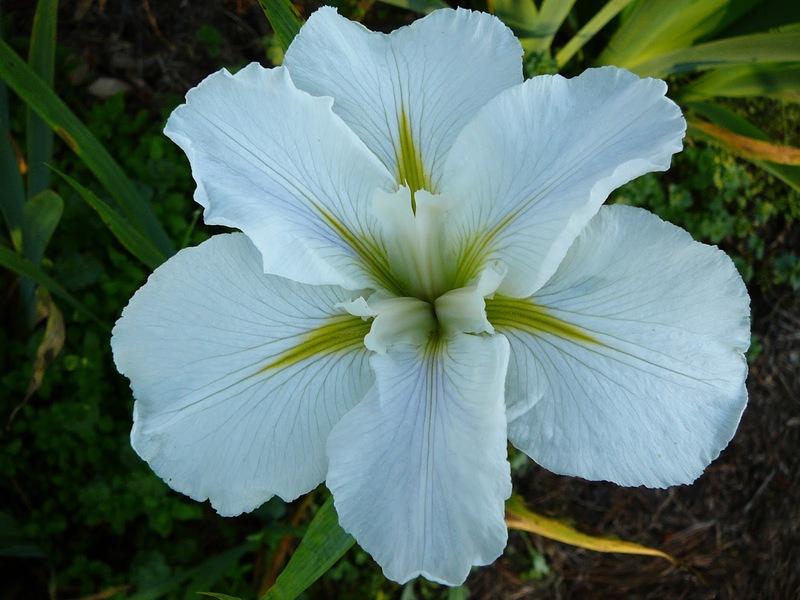 There are still quite a few white Louisiana irises to be found in the native habitat, especially in south Louisiana, and most likely in the species i.giganticaerulea. In other postings we discussed other flower colors to be found in Louisiana irises. 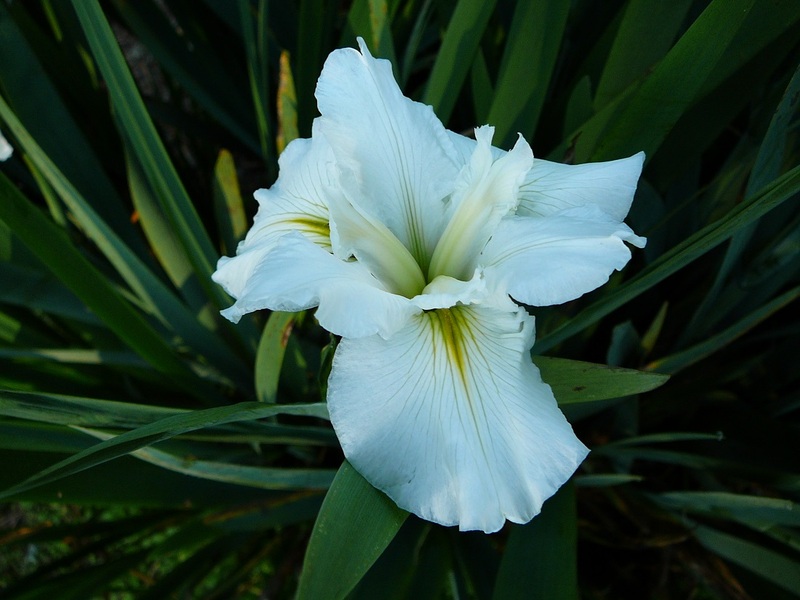 Today we look at some of the white Louisiana irises. Again, different people see color in different ways so you may not find all these irises to be what you consider as "white". Without further discussion, let us jump right into examining some fine examples of white Louisiana irises. 'Acadian Miss' by Charles Arny, 1980. 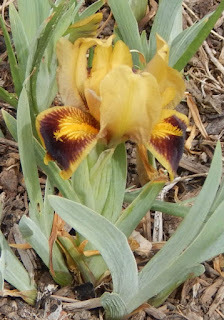 This is one of the first Louisiana irises to exhibit some ruffling on the edges. 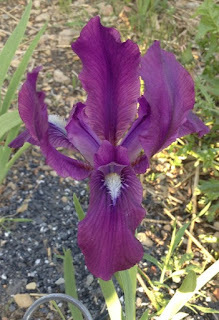 The very first iris to show ruffling was 'Charlie's Michele' (Arny 1969) which was a rose colored iris. 'Charlie's Michele' was the pod parent of 'Clara Goula' (Arny 1975) and the ruffling is quite nice on 'Clara Goula'. 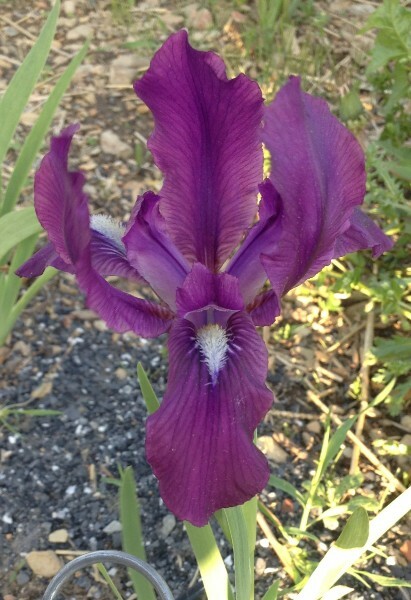 'Clara Goula' was the pollen parent for 'Acadian Miss' and passed some of the ruffling on toe this iris. 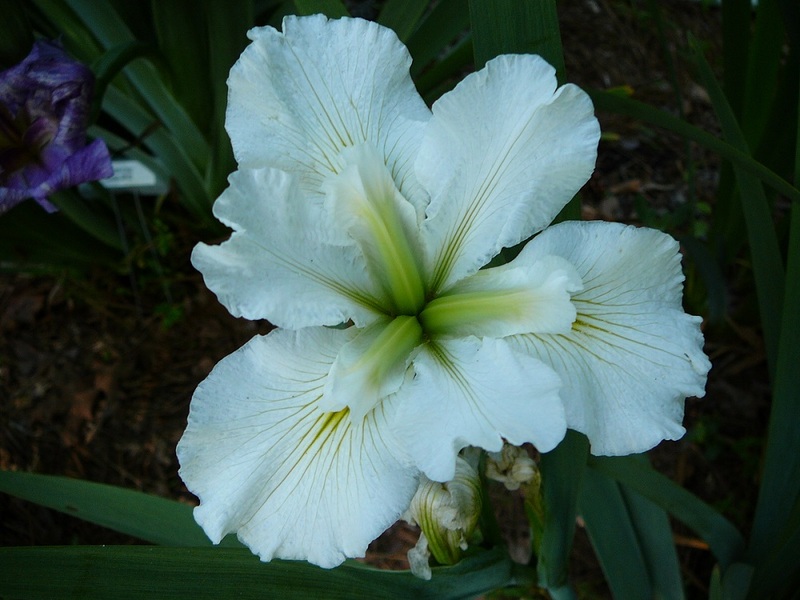 It is distinguished for other white irises by the ruffling and the bold green style arms. 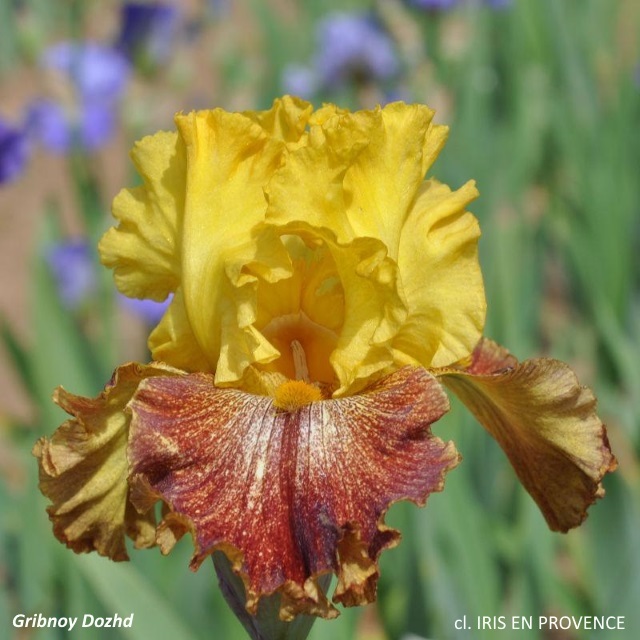 'Circe Miss' resembles 'Acadian Miss' but there is a difference in the two irises. This one does not have as much ruffling and the signals are somewhat different. This is not a great picture of 'Clara Goula' and again you can see the resemblance of the progeny. This is an example of a bloom that has recently opened. Below is an example of blooms that are a few days old and you can see how the petals re-curve somewhat in the picture below. If you have even been in a cotton field just before picking time, the cotton bolls do resemble this iris. This iris tends to be more "light yellow" when first opened but fades to a pleasing white that can stand up to hot weather. 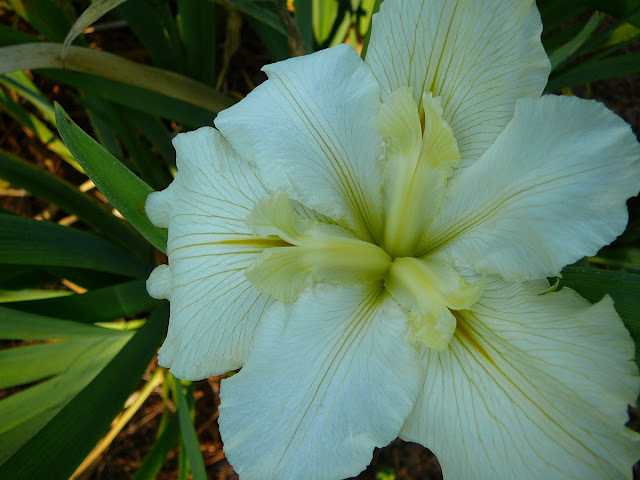 This is one of the "famous" white irises and it has been used in many hybridizing attempts/successes. It is registered as "White self", no further description. Again you can see the characteristics of the parents back to 'Charlie's Michele'. This is a collected i.giganticaerulea alba and is one of my favorite white irises in the old open form. We have a huge patch of this iris and it puts on quite a show every year. It won the Mary Swords DeBallion Award in 1959, the highest award most Louisiana irises will ever win. 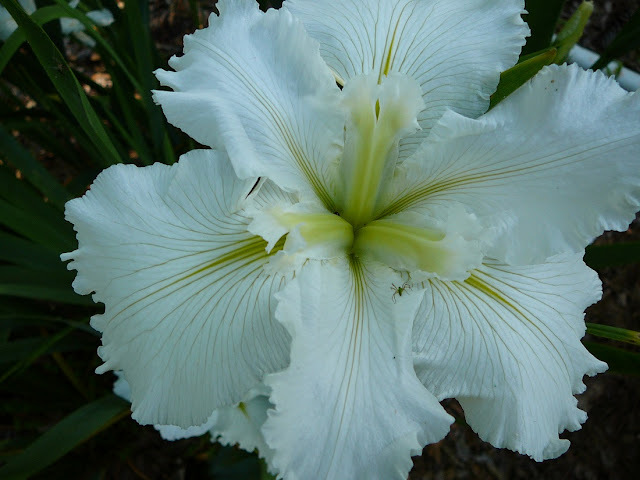 Registered as "white, diamond dusted icy blue" and a great description of this iris, another of my favorites. When it first opens, the area near the style arms dust in fact have a dusted icy look. The pinkish blush also sets it apart for other white irises. A lot of Taylor's white irises have 'Helen Naish' (J. C. Taylor 1979) as one of the parents (pollen parent in this case). 'Helen Naish' has 'Clara Goula' as the pod parent. The real Inez Conger lived in Arcadia, LA, and raised many irises back in the 1950-70 time frame. 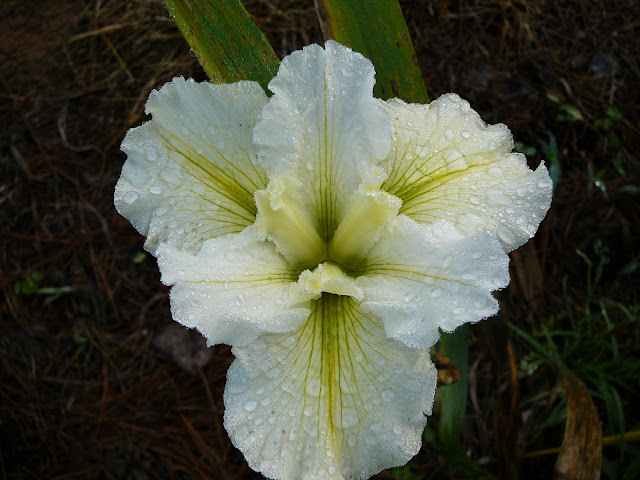 Her son, Sidney Conger, hybridized many Louisiana irises. This one is registered as "white self, large orange signal" as if you paid the registration fee based on the number of words in the description! It is registered as "stands and falls soft lemon". Perhaps this is a picture of a bloom a few days old and has faded to a pleasing white with a yellow blush. I bet you could trace the parentage back to one of the famous white irises. 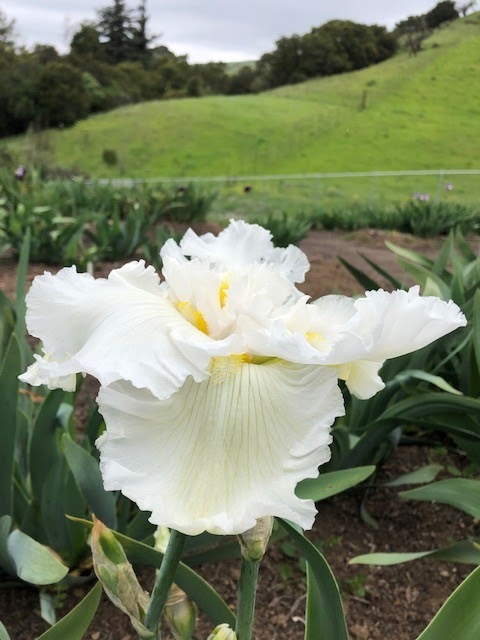 Dorman named this iris for Longue Vue Home and Gardens in New Orleans. It has 'Dural White Butterfly' for the pollen parent. 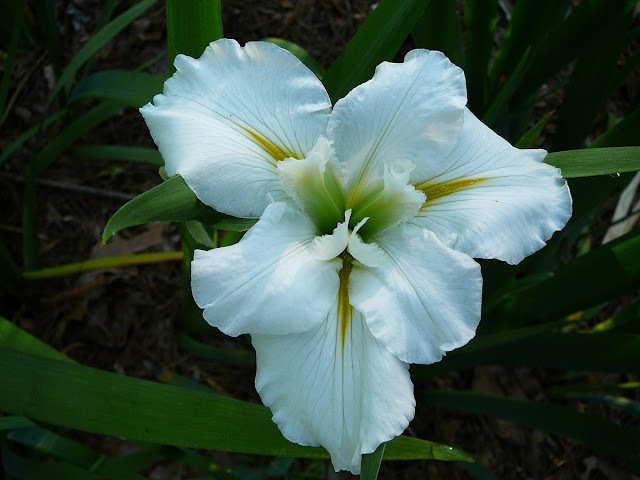 This is one of the most well know white Louisiana irises. Another nice picture of 'Longue Vue'. Another fine example of a white Louisiana iris, this one with cream colored style arms and nice signals. The registration says it has "pronounced sweet fragrance" but I have seldom found a Louisiana iris with fragrance. I must check it out next year if I can simply remember to do so! 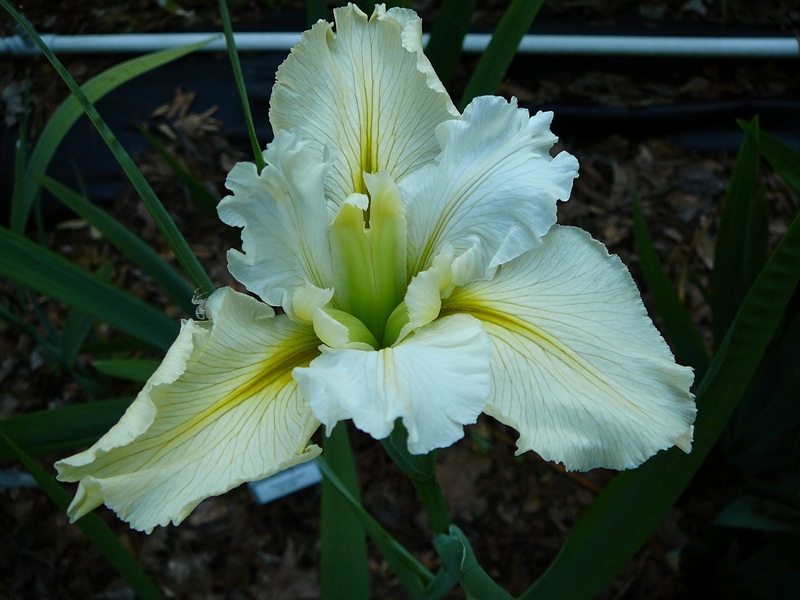 A very nice white iris that won the Caillet Cup in 2009. It grows pretty short for me but really puts on a show during bloom season. The pod parent is 'Charlie's Michele' and the pollen parent is 'Ila Nunn' (Arny 1967), a pretty light yellow, registered as white, which I assume pleasingly fades to white. No, I did not misspell the name. Marvin hybridized quite a few of the "cartwheel" form and this is by far one of my favorites. It will win you a nice ribbon on the show table. It has all falls and no stands. A very nice iris that will catch you eye during bloom season. It has 'Exquisite Lady' (A. Owen, 1986) as the pod and pollen parents. 'Exquisite Lady' has a silver rim (halo) on the stands and falls but I see that did not get passed to the progeny. 'Texas Toast' by Joe Mertzweiller, registered by Marie Caillet in 2005 after Joe's death. It is a tetraploid registered as "cream" but fading to white. 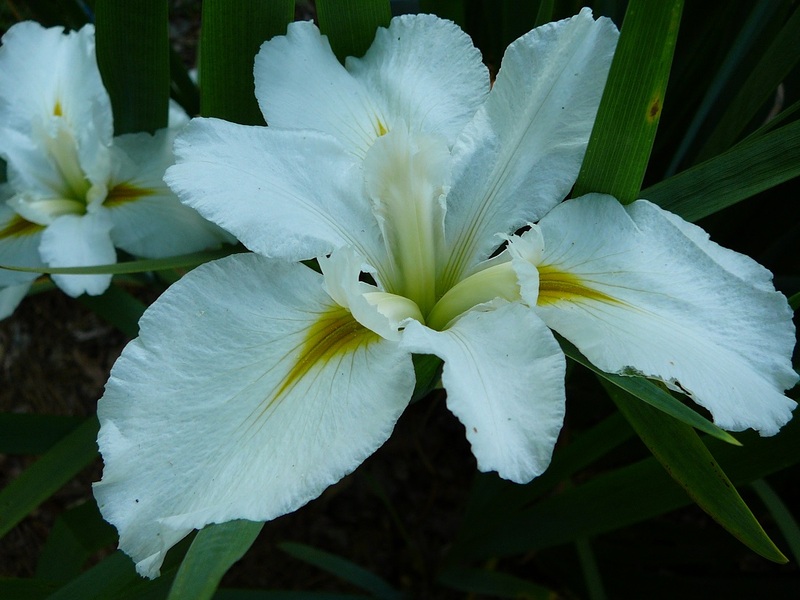 To learn more about Louisiana irises, visit their website here. Until the 1990s the world of iris was limited to Western Europe, North America, and the two major islands of Oceania. 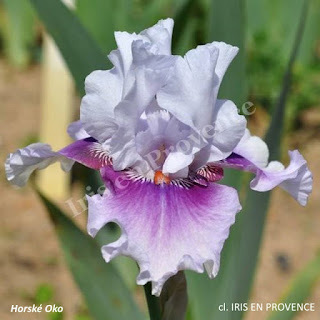 At that time, iris lovers in these countries were not interested in the rest of the world, and the belief was that the rest of the world was not interested in irises. At least that's what was commonly accepted. 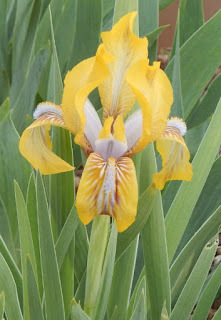 It all changed due to the Florence International Competition in Italy, when the existence of iris interest in other parts of the globe became known. Two major events opened the eyes of the western world, that there were irises elsewhere, and especially behind the Berlin Wall and the Iron Curtain. 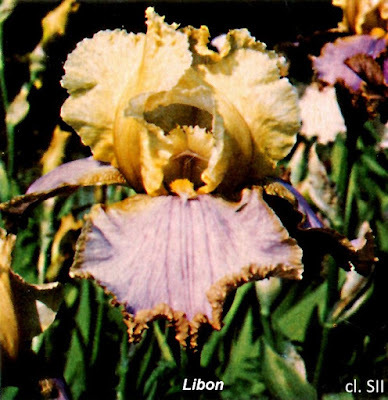 In 1985, a variety called 'Libon' (Smid, unregistered) triumphed in Florence. This elegant variegata won over 'Cameo Wine' (Blyth, 1982) and 'Fort Apache' (Schreiner, 1982). These were irises from the great American-Australian tradition, that were accustomed to winning the awards. The second event was the victory in 1995 of 'Ikar' (Volfovitch-Moler, 1995), a variety from Uzbekistan, a country whose very existence was not known to everyone, and winning it did, in a competition that included 'Classic Look' (Schreiner, 1992) and 'Goldkist' (P. Black, 1993). At that point, iris growers knew that there was something new happening in Eastern Europe. 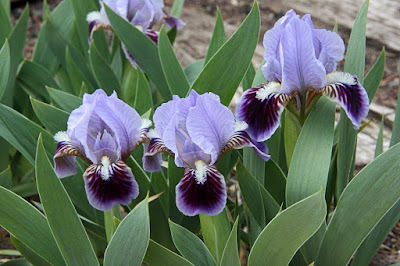 In Eastern Europe, iris culture is determined by climatic conditions. In the southern areas, it is the summer heat that is not suitable for large iris (TB); in the northern states, it is the cold and wet winters that are unfavorably to good growth. The suitable area for growing irises extends roughly between the 41st and 56th parallels. This is why, for this article, I will focus on five states: Czech Republic, Slovakia, Poland, Ukraine, and Russia. Iris ‘'Libon' is from the Czech Republic. In the 1980s the problem for those who wanted to try iris hybridization was to obtain broodstock for interesting crosses. In an economy completely in shambles, it was necessary to be cunning and, most of the time, to get the rhizomes secretly, without telling others how it was obtained. This is how 'Libon' was produced, its creator Wojtech Smid made the crossing Crinkled Gem X Amigo's Guitar, two varieties dating to 1964. At the same time a well-known scientist in the field of botany and horticulture, Milan Blazek, who practiced hybridization himself and took advantage of his contacts abroad also helped by bringing back some plants. All this was improvised, and it is quite surprising that W. Smid managed to send some varieties to Florence. Before the collapse of the Soviet bloc, elsewhere in Eastern Europe, the iris world was non-existent. Except, it must be pointed out, in the USSR itself, where Professor Rodionenko had acquired a world-wide reputation in botany and specifically in iris botany. Some daring individuals tried to hybridize with means as limited as those available to the Czech hybrizers, and for no other purpose than to indulge themselves. For example, only after 1990 was it announced that Vitali Gordodelov, a former Red Army officer in the Caucasus in Stavropol, or Irina Driaghina of Moscow, were creating new irises. 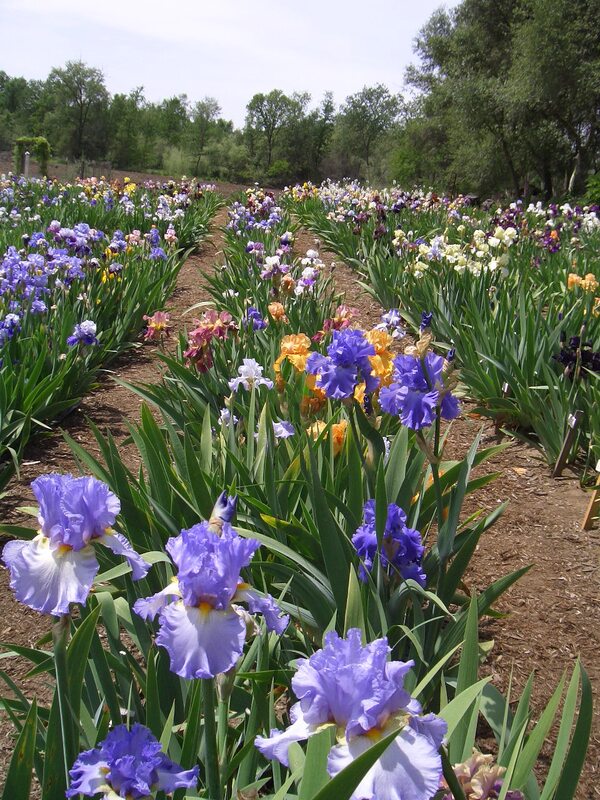 The dismemberment of the Soviet Union was the occasion for the emergence of a large number of new iris hybridizers. In the Czech Republic, for example, where there has always been a nucleus of hybridizers, they were immediately organized and they even created their catalogs including the western irises they had obtained, and many skilled and inspired horticulturists appeared: Josef and Jiri Dudek, Pavel Nejedlo, and Zdenek Seidl. These four very good hybridizers made themselves known beyond the borders of their country, as soon as they could export their production. The situation in neighboring Slovakia was about the same. But only one breeder managed to conquer the western world: Ladislaw Muska. As soon as he was able to acquire modern varieties he embarked on a highly developed hybridization program. His varieties appeared in France in the late 1990s and, moreover, have distinguished themselves in competitions organized very quickly in Eastern Europe and Russia. In Poland, the movement was launched by a former actor and director, Lech Komarnicki. Living in the north-west of the country, he encountered major setbacks with his irises when they were destroyed by frost. But these difficulties did not dampened his enthusiasm and he has become an inescapable element of irisdom in his country and neighboring countries. In Ukraine, an exceptional person was at the origin of the movement: Nina Miroshnichenko, wife of an officer of the Red Army, garrisoned in the east of the country, with rudimentary means, undertook a remarkable hybridization work. She was quickly joined by a nurseryman, Alexandr Trotskiy, whose varieties quickly joined the international level. Sergei Loktev, extravagant and passionate character, launched the movement in Russia. He abandoned all other activities to focus on hybridization and created in twenty years nearly 800 new irises of all categories! At the same time he organized the Russian Iris Society, which became one of his most important achievements. Many hybridizers followed his example, and thus Russia became one of the countries with the highest number of new varieties. 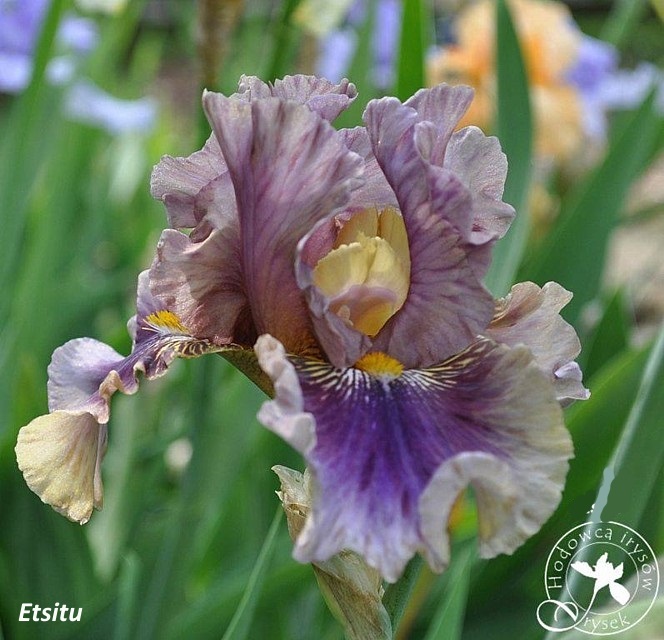 Today the countries of Eastern Europe and Russia constitute major centers of iris collections in the world. Some young hybridizers have become admired personalities for the quality and originality of their introductions. 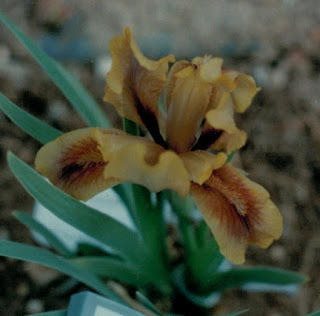 This is the case, in Slovakia, of Anton Mego, a hybridizer that has become known in the United States since his iris 'Slovak Prince' (2002) received a Wister Medal in 2009. A distinction as prestigious and as difficult to receive, which is a true testament to his talent. 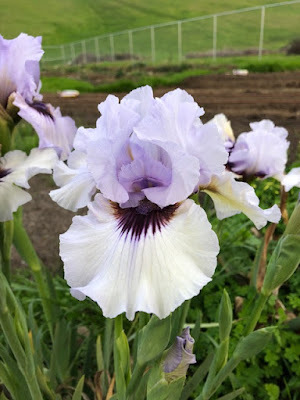 In Poland Robert Piatek, has hybridized irises since the early 2000s, has done considerable work but unfortunately, is still poorly known outside his country. Other Polish hybridizers have followed suit. Several Ukrainian breeders, benefiting from more favorable climatic conditions, have created irises that are not yet sufficiently known elsewhere than in Ukraine. They are Igor Khorosh and Svetlana Yakovchuk. Both, with seemingly interesting varieties, seek to make themselves known abroad. The world of iris in Russia is experiencing a real explosion. Three or four names rise above the lot. As Olga Riabykh, Vladimir Osipenko, Viktor Kolesnikov, Marina Volovik, who are among the best known. However, it seems that these hybridizers have difficulty marketing their products outside their country of origin. Some of the issues could be due to the current state of international political conflicts. Some other breeders also deserve to be recognized: Izidor Golob, in Slovenia, who works quietly in his small country; Laimonis Zakis in Lithuania, a maverick, who creates irises comparable to those elsewhere in the world, but refuses to register them and does not intend to make himself known outside his home. By spreading throughout Eastern Europe, the cultivation of irises has entered a new field. We can only rejoice at this expansion. But it must be said that irises still have many parts of the globe to conquer. Editor's Note: Sylvain Ruaud is a well known iris authority in Europe, keeping up with iris news and events in that part of the world. He writes about gardens and irises on his French blog Irisenlige and this is his second posts for us. In future posts, he will continue to update us about the world of irises in Europe.